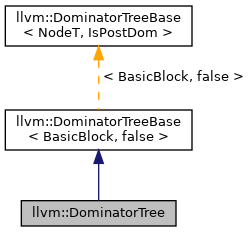 Concrete subclass of DominatorTreeBase that is used to compute a normal dominator tree. Definition: A block is said to be forward statically reachable if there is a path from the entry of the function to the block. A statically reachable block may become statically unreachable during optimization. A forward unreachable block may appear in the dominator tree, or it may not. If it does, dominance queries will return results as if all reachable blocks dominate it. When asking for a Node corresponding to a potentially unreachable block, calling code must handle the case where the block was unreachable and the result of getNode() is nullptr. Generally, a block known to be unreachable when the dominator tree is constructed will not be in the tree. One which becomes unreachable after the dominator tree is initially constructed may still exist in the tree, even if the tree is properly updated. Calling code should not rely on the preceding statements; this is stated only to assist human understanding. Definition at line 144 of file Dominators.h. Definition at line 146 of file Dominators.h. Definition at line 149 of file Dominators.h. Definition at line 150 of file Dominators.h. References llvm::tgtok::Def, F(), Name, and llvm::DominatorTreeBase< NodeT, IsPostDom >::Parent. This performs the special checks necessary if Def and User are in the same basic block. Note that Def doesn't dominate a use in Def itself! Definition at line 248 of file Dominators.cpp. References E, llvm::Instruction::getParent(), llvm::Use::getUser(), and I.
Referenced by AllUsesDominatedByBlock(), llvm::MemorySSAUpdater::applyInsertUpdates(), llvm::LoopAccessInfo::blockNeedsPredication(), BrPHIToSelect(), calculateUnswitchCostMultiplier(), checkBasicSSA(), checkHoistValue(), CheckMACMemory(), CompareSCEVComplexity(), containsUnconditionalCallSafepoint(), llvm::createSeparateConstOffsetFromGEPPass(), doesStoreDominatesAllLatches(), llvm::OrderedInstructions::dominates(), enableCallSafepoints(), ensurePromotedGV(), findBasePointers(), findBBsToSinkInto(), findCallsAtConstantOffset(), llvm::ScalarEvolution::forgetValue(), llvm::formLCSSAForInstructions(), LoopFuser::fuseLoops(), llvm::ScalarEvolution::getBlockDisposition(), llvm::InnerLoopVectorizer::getBroadcastInstrs(), getFirstNonAllocaInTheEntryBlock(), getInsertPointForUses(), llvm::MemoryDependenceResults::getInvariantGroupPointerDependency(), llvm::ScalarEvolution::getLoopDisposition(), getMemSetPatternValue(), getReductionValue(), getSignature(), llvm::SCEVExpander::hoistIVInc(), llvm::hoistRegion(), llvm::DivergenceAnalysis::inRegion(), insertParsePoints(), IsAcceptableTarget(), IsAvailableOnEntry(), IsBackEdge(), llvm::RecurrenceDescriptor::isFirstOrderRecurrence(), isFullDominator(), isKnownNonNullFromDominatingCondition(), llvm::isOverflowIntrinsicNoWrap(), llvm::isPotentiallyReachableFromMany(), isSafeToSpeculatePHIUsers(), isSupportedGuardInstruction(), llvm::isValidAssumeForContext(), IVUseShouldUsePostIncValue(), moveSpillUsesAfterCoroBegin(), moveUp(), nearest_common_dominatee(), FusionCandidateCompare::operator()(), optimizeDivRem(), partitionOuterLoopBlocks(), PickMostRelevantLoop(), llvm::promoteLoopAccessesToScalars(), llvm::GVNHoist::rank(), RemoveInstInputs(), llvm::replaceDominatedUsesWith(), ReplaceUsesOfWith(), reportMayClobberedLoad(), rewriteDebugUsers(), rewriteSingleStoreAlloca(), separateNestedLoop(), shouldConvert(), llvm::CaptureTracker::shouldExplore(), simplifyCommonValuePhi(), llvm::sinkRegion(), unswitchBestCondition(), unswitchNontrivialInvariants(), and valueDominatesPHI(). Definition at line 115 of file Dominators.cpp. References llvm::BasicBlock::begin(), llvm::tgtok::Def, llvm::Instruction::getParent(), and I. Definition at line 152 of file Dominators.cpp. Return true if an edge dominates a use. If BBE is not a unique edge between start and end of the edge, it can never dominate the use. Definition at line 230 of file Dominators.cpp. References llvm::dyn_cast(), llvm::BasicBlockEdge::getEnd(), llvm::Instruction::getParent(), llvm::BasicBlockEdge::getStart(), and llvm::Use::getUser(). Definition at line 178 of file Dominators.cpp. References E, llvm::BasicBlockEdge::getEnd(), llvm::BasicBlock::getSinglePredecessor(), llvm::BasicBlockEdge::getStart(), llvm::pred_begin(), and llvm::pred_end(). Definition at line 103 of file Dominators.cpp. Definition at line 299 of file Dominators.cpp. References llvm::dyn_cast(), llvm::Instruction::getParent(), llvm::Use::getUser(), and I.
Referenced by buildExtractionBlockSet(), CreatePrologue(), deleteDeadBlocksFromLoop(), deleteDeadClonedBlocks(), eliminateDeadStores(), findBestInsertionSet(), findUnconditionalPreds(), foldUnusualPatterns(), getInnermostLoopFor(), getInsertPointForUses(), hasUndefContents(), llvm::SSAUpdaterBulk::HasValueForBlock(), insertParsePoints(), isBlockInLCSSAForm(), llvm::isPotentiallyReachable(), llvm::isPotentiallyReachableFromMany(), isSupportedGuardInstruction(), llvm::PHITransAddr::PHITranslateValue(), ProcessBlock(), llvm::TruncInstCombine::run(), llvm::RewriteStatepointsForGC::runOnFunction(), llvm::CaptureTracker::shouldExplore(), sink(), SortNonLocalDepInfoCache(), and UpdateAnalysisInformation(). Definition at line 82 of file DomPrinter.cpp. Definition at line 90 of file DomPrinter.cpp. References llvm::errs(), llvm::DominatorTreeWrapperPass::getDomTree(), llvm::PassRegistry::getPassRegistry(), llvm::PostDominatorTreeWrapperPass::getPostDomTree(), INITIALIZE_PASS(), llvm::initializeDomOnlyViewerPass(), llvm::initializeDomViewerPass(), llvm::initializePostDomOnlyViewerPass(), and llvm::initializePostDomViewerPass().